Ponding water is discussed by the National Roofing Contractors Association as water that remains on a roof surface longer than 48 hours after the most recent rain event. For flat roofs, even the smallest low area in the roof can result in ponding water. As time goes on, the standing water can actually deform the roof’s structure, leading to structural bending and, in a worst case scenario, roof failure. However, in the events leading up to failure, ponding can cause a variety of other costly problems. Surface damage. 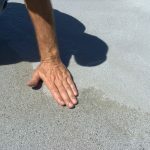 Ponding water acts as a welcome home to all kinds of microscopic living organisms, and some of those can actually consume the roofing material or adhesive. Over time, the effect of this organic matter consuming a roof can cause significant physical damages. Vegetation growth. In most cases, ponding water can be host to more than just small organic matter – it can even support the growth of algae and other vegetation. Again, this will inevitably damage the surface of the roof. However, vegetation growth presents an additional problem, as the vegetation itself will obstruct any drains or gutters, which only increases the water ponding problem. Accumulation of debris. Dirt, chemicals, leaves, and other debris that normally would be windswept will remain on the roof if it lands in the ponding water. Similar to vegetation, this debris can damage the roof’s surface and clog drains, exacerbating the water ponding. Structural deformation. The weight of ponding water means that the roof’s load has significantly increased, which can cause the roof to deflect. Increased deflection means the low points in the roof get lower, which causes more water to pond. This compounding problem can quickly lead to permanent structural damage. 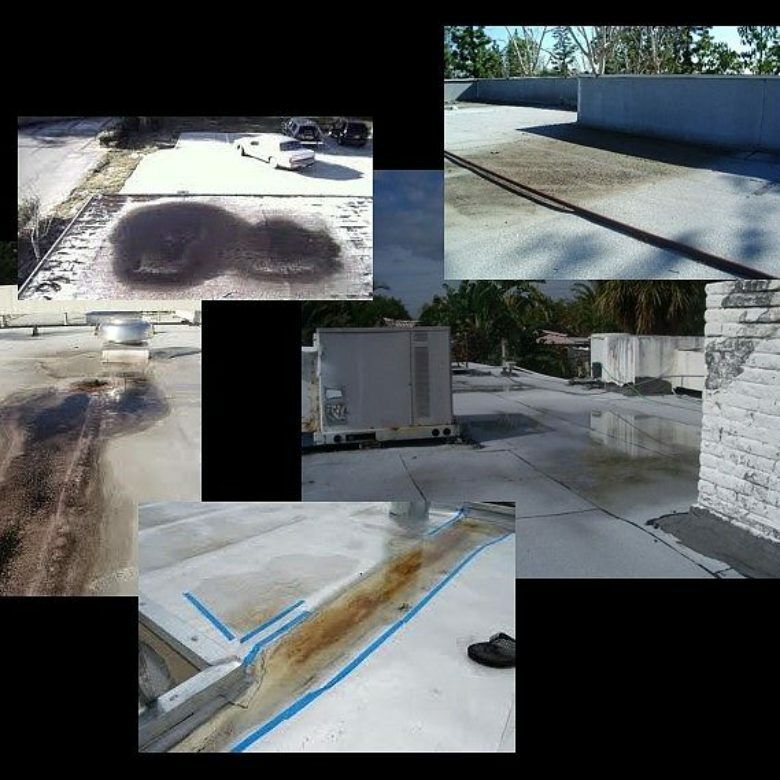 Accelerated roof aging. 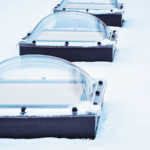 Water will actually magnify UV rays, especially on white or asphalt roofs that are common on many modern commercial buildings, which will accelerate the UV degradation of the roof. Moisture intrusion. As the water stands on the roof and slowly seeps through the membrane, it can gain entry to the framing of the roof, insulation, and even the interior of the building itself. Aside from the fact that waterlogged insulation has a decreased thermal efficiency, water intrusion can cause a vast amount of damage to the internal structural components of the building such as the framing or drywall. Other than the substantial physical damages caused by ponding water, why should you avoid this problem? Well, any physical damage to your building means hefty financial costs, but not just in repairs. While a roof replacement can easily reach tens of thousands of dollars in repairs alone, the true cost is in lost productivity. Any time a building has a significant leak or a comprehensive roof replacement, work inside that building is often limited or halted completely. So not only are you now responsible for repair costs, but also the cost of lost income and reduced productivity. To make it even worse, many roofing insurers exclude ponding water from their contracts, so all the associated problems with this phenomenon will have to be fixed with money from your own checkbook. As you can see, water ponding is a multi-faceted problem, causing many issues that carry with them a very hefty repair fee. In addition to the potential costs of repairs, you must consider the lost income that comes with extensive repairs on a production facility. However, there is always a solution! And, as with many problems, preventative measures are the best and most cost effective solution. 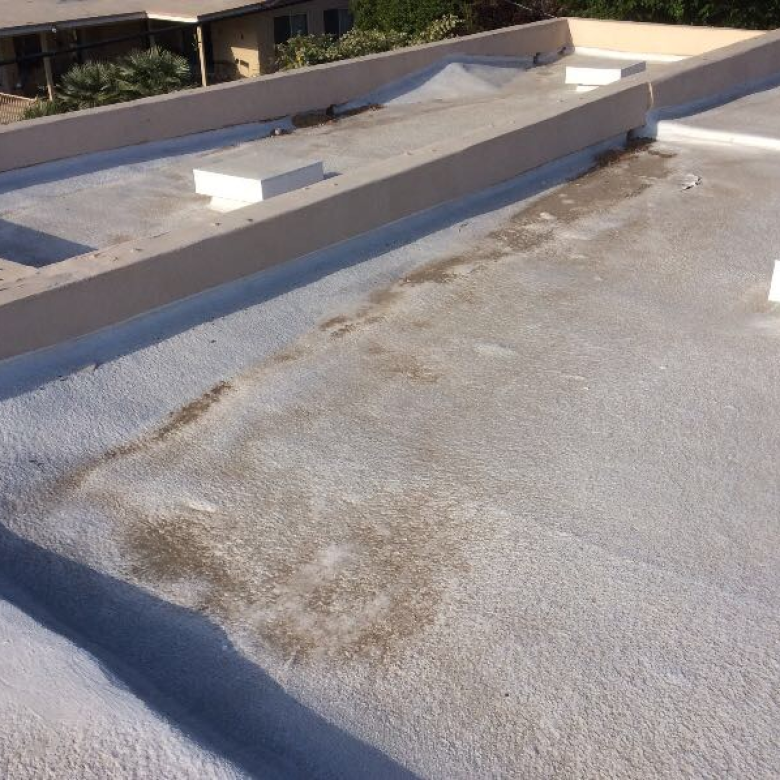 If you are concerned about water ponding and would like to avoid costly future repairs, contact us for more information on how to achieve a proper positive roof slope for adequate water drainage.